How A Blast Wave Affects Cells In The Brain : Shots - Health News Harvard researcher Kit Parker built his academic career studying the heart. But Parker, also an officer in the U.S. Army Reserve, switched his focus to figuring out how IED blasts damage the brain. Editor's note: This longform journalism project chronicles a soldier-scientist's quest to figure out how battlefield explosions injure brains. It was first published on Shots in June, and is running on NPR's Morning Edition on July 25 and Aug. 1. The project includes a second story on how the U.S. military changed its response to traumatic brain injury based on this discovery. The first time Kit Parker's phone rang, everything seemed fine. It was January 2006, and Parker's old Army buddy Chris Moroski was calling to say hi. Parker and Moroski had jumped out of airplanes together in the 1990s when they were paratroopers in the National Guard. But after the attacks on Sept. 11, Parker had been deployed to Afghanistan, his friend to Iraq. They'd lost touch. 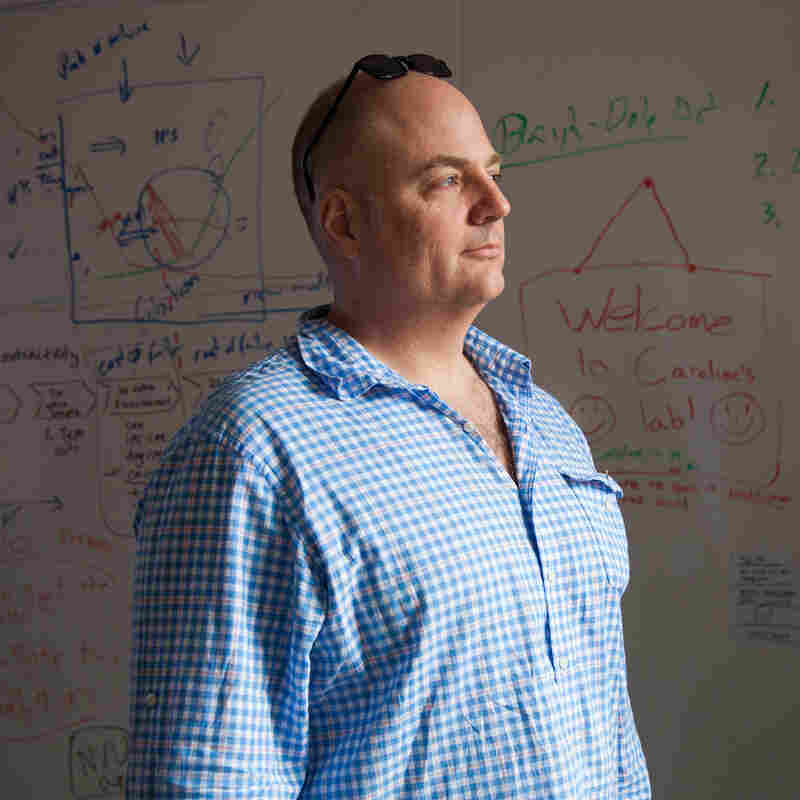 Parker had come back from his tour in 2003 to start a new job as a biophysicist on the faculty at Harvard. At 6-foot-5, with a shaved head and a booming drawl, he'd never exactly blended in on campus. But he'd avoided talking about military stuff. And he'd worked obsessively to establish his scientific credentials as an expert on heart muscle cells. Now Moroski was back too. But his return had been rougher. He was calling from Dwight D. Eisenhower Army Medical Center at Fort Gordon, Ga. He'd ended up there after an IED had blown up his vehicle during a patrol near Ramadi. Moroski had been hurt, but his doctors promised he'd recover. The men made small talk, exchanged insults and joked about the Army. Then they hung up. A couple of days later, Parker got a second call from his friend. A few days after that, there was a third call. Something about Moroski wasn't right. "He'd lose his train of thought," Parker says. "He couldn't remember stuff," including events a soldier would never forget. Parker asked Moroski whether he'd received the Purple Heart in Iraq. Moroski didn't know. "That's when I realized something's wrong here," Parker says. The details came slowly. Moroski was the kind of soldier who didn't talk about his troubles. And Parker was the kind of friend who didn't push. "Somehow I realized he's asking for help," Parker says. "It's not being verbalized, but that's why he's calling." Parker would spend the next decade answering that call. He would reset the trajectory of his career. And ultimately, he would make a discovery that changed scientists' understanding of the battlefield brain injuries sustained by hundreds of thousands of troops in Iraq and Afghanistan. But Parker's first step was to learn everything he could about what had happened to Moroski in Iraq. In 2005, Moroski had been in charge of a team that often went to Tamim, a neighborhood outside Ramadi along the Euphrates River. They would leave in the dark in an M113 armored personnel carrier, arrive well before dawn, then watch the sun rise over the desert. They were part of an effort to win over the hearts and minds of the Iraqis. The team spent its days handing out coloring books, crayons and soccer balls to boys who would flock to the American tank as if it were an ice cream truck. For cultural reasons, male soldiers rarely interacted with Iraqi women or girls. But one afternoon, after running out of soccer balls, Moroski spotted a girl of 4 or 5 standing by the road. He grabbed two fabric dolls, and stepped out of the M113. "I left my rifle inside because I'm 6-foot-3 and scary enough," he says. Moroski got on his knees to offer the dolls. The girl took them with a huge smile. "It was a human connection," Moroski says. "It was awesome." The next day, in the same neighborhood, Moroski's vehicle rolled over an IED. As the team leader, he was riding with his head just far enough out of the hatch to scan the road ahead. The vehicle's armor deflected the heat and shrapnel from the bomb, but not the blast wave. A blast wave is a pulse of highly compressed air that expands outward from an explosion faster than the speed of sound. The force ruptured one of Moroski's eardrums and hurled him back into the vehicle. The result was the signature wound of the wars in Iraq and Afghanistan: a mild traumatic brain injury, or TBI, caused by a bomb blast. Like a lot of service members, Moroski experienced several concussions during his time in combat. Being hit by a blast wave, he says, is a bit like getting tumbled by a big ocean wave: "You can't control your body or what's happening until you come to rest, and then everything hurts." After each of the earlier blasts, Moroski had been able to shrug off his symptoms and go back on patrol. But this had been a bigger bomb at closer range. Moroski has almost no memory of the hours just after the explosion, though he was told he took part in a firefight. He does remember being unable to hear much or perceive colors. In the coming days and weeks, Moroski had unrelenting headaches. He felt dizzy and vomited frequently. He couldn't think clearly or remember things. And he couldn't sleep. "At the time, head injuries weren't really a thing," Moroski says. "No one really considered why I was vomiting all the time. No one considered that it was probably from a concussion." As was often the case with a TBI caused by a blast wave, Moroski had no sign of physical injury, other than his burst eardrum. Military doctors assured him he was fine. And Moroski wasn't a complainer. "You want to go back to work," he says. "You don't want to let anyone down." When Moroski didn't get better after a few weeks, medical personnel began to suggest the problems were not from the force of the blast, but from the fear it induced. In other words, his wounds were purely psychological. They began to talk about things like combat stress reaction and post-traumatic stress disorder. Eventually, he got sent to Fort Gordon. There, another group of doctors seemed baffled by his symptoms and suspicious of their origin. "They were saying, 'This can't be a head injury; there's some psychological reason you're acting this way,' " Moroski says. He spent months in a dormitory-like building separate from the hospital. The doctors gave him pain pills for his headaches and motion sickness medication for his dizziness. But he says the only real treatment plan seemed to be waiting. When Chris Moroski was hurt in 2005, "head injuries weren't really a thing," he recalls. "No one really considered why I was vomiting all the time. No one considered that it was probably from a concussion." Moroski hit a low point over the Christmas holidays, when maintenance workers apparently forgot there were still patients in the building. "They turned the heat off, and I felt very alone," he says. "I kept thinking, 'I'm not faking this, and no one believes me.' "
The military doctors had labeled Moroski a head case. But they didn't know Moroski. Parker did. And the Moroski he knew had been sharp and focused, and never seemed to get rattled. Still, Parker was perplexed. His friend's persistent symptoms were what you might expect with a more severe head injury, one that caused obvious bleeding and swelling in the brain. But Moroski just had a concussion. He'd had his bell rung. Or at least that's what everyone kept telling him. One night, after yet another phone conversation with Moroski, Parker sat in his Cambridge apartment and stared at the wall. "I was infuriated by the whole thing," he says. 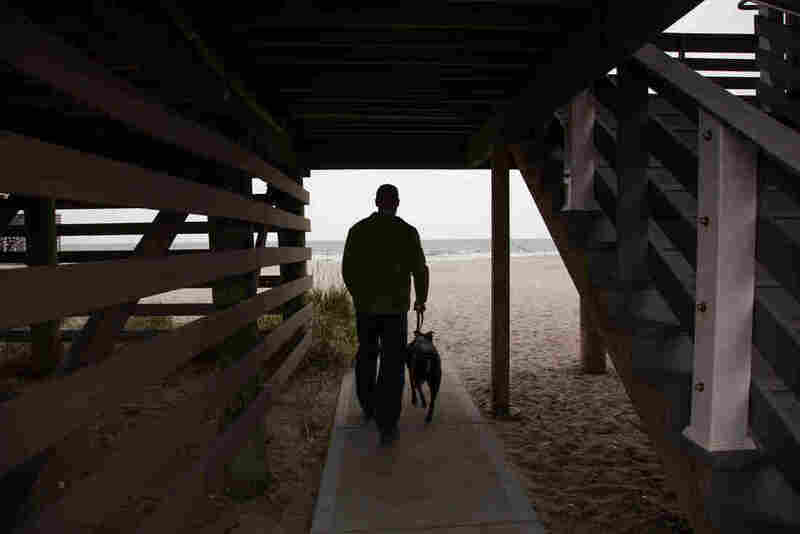 The next day, he used his military contacts to get Moroski moved to Walter Reed Army Medical Center in Washington, D.C., where doctors finally gave him medications that helped him sleep. Before long he would be well enough to return home to Rhode Island. But what about Moroski's brain? There had to be a scientific explanation for what had happened. Parker decided he would launch a mission to find it. "I had to bring the battlefield into the lab," he says. It was a decision that would merge Parker the soldier with Parker the scientist. And ultimately, it would lead him to a discovery about the brain that came directly from his years of research on the heart. At Harvard, Parker had been studying the structure and function of heart muscle cells. He'd published several groundbreaking papers on how these cells respond to mechanical forces, like the stretching that occurs when blood pressure goes up. Now, though, Parker was planning to take on a problem affecting a different organ, one considered the most complex object in biology. "What I knew about brain injury was zero," he says. Even so, Parker wasn't intimidated. As a boy growing up in the cows-and-cotton landscape of central Texas, he'd dissected roadkill to figure out how animals worked. Later, he'd chosen biophysics because it allowed him to study life at every level, from atoms to environments. He was used to big questions. The integrin protein (red) connects the outermost layers of a cell to the structures inside. The shock wave from a blast can cause the integrin to send unhealthy and sometimes fatal signals to the structures inside cells. Parker began to ponder what he did know: the heart. And he came up with a hunch about how blast waves were causing brain injury. By a twist of fate, Parker's doctoral thesis had looked at a potentially lethal injury known as cardiac concussion. The victim is typically a healthy young athlete struck by a baseball or some other projectile, just over the heart. "A hockey puck hits someone and they go down, sudden cardiac death," Parker says. "A single blow to the heart causes an electrical irregularity, and they can die." Parker had investigated how this sort of blow — a brief mechanical force — could affect the behavior of heart cells. And his research had led him to proteins called integrins, which connect the outermost layers of a cell to the structures inside. When a force is applied to the outside of a heart cell, integrins convert the energy into chemical signals. Usually, these signals are helpful. For example, when integrins detect physical stresses associated with exercise, the proteins produce signals that cause heart muscle to become thicker and stronger. But Parker had discovered that certain forces, like being struck in the chest by a hockey puck, can cause the integrins in heart cells to send signals that are unhealthy, sometimes even lethal. Now he was wondering whether a brain concussion might be a bit like a cardiac concussion. "The blast wave hits the head — BOOM! — and these signaling pathways inside the cell are pathologically activated," he says. The heart guy had come up with a hypothesis about the brain. Now he needed money and researchers to test it. On a set of napkins, Kit Parker sketched out his theory about blast wave damage to the brain. His team then designed experimental equipment to test the effects of blast waves on cells in the lab. At 6 a.m. on Oct. 27, 2006, Parker met with Borna Dabiri, an undergrad from his lab. They sat down at a table in a Starbucks, and Parker began sketching out his hypothesis on paper napkins. By the end of the meeting, "I had this stack of napkins," Dabiri says. "So I stapled all those napkins into my lab notebook." Dabiri's assignment was to build instruments that would allow the lab to subject living brain cells to the same forces produced by an IED blast wave. And pretty soon Dabiri had come up with devices that could stretch and twist and compress cells just as an explosion does. Next, Parker needed to see whether applying blast-wave-like force to brain cells really did change the signals coming from integrin proteins. He didn't have the time or money to do a lot of preliminary experiments. "We had to go for broke from the beginning," Parker says. He assembled a small team that included Dabiri and Josh Goss, a Marine who had served in Iraq. For four years, they tweaked living brain cells in every way imaginable. In 2009, Parker returned to Afghanistan. This time, he was deployed as a scientist as well as a soldier, helping the Center for Army Lessons Learned figure out how to protect troops from IEDs. On March 22, he was with a platoon in the Tangi Valley looking for explosives along a narrow, twisting road carved into the side of a cliff. They found one — the hard way. 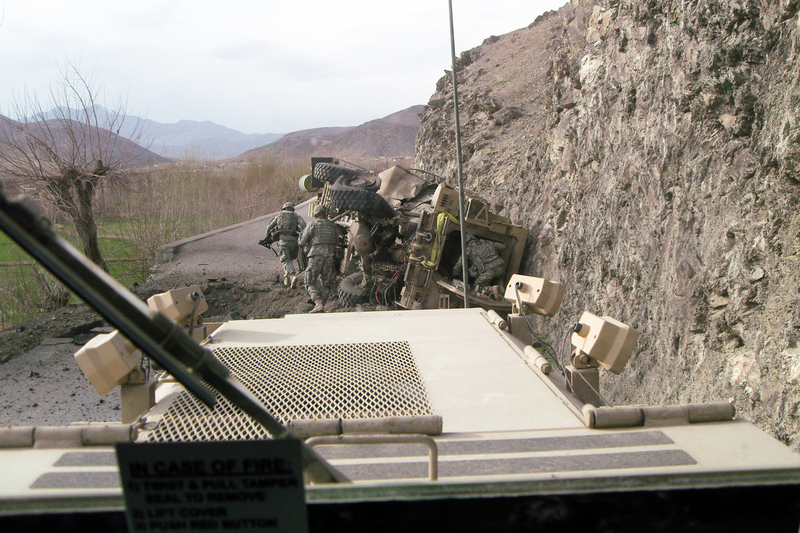 A mine-resistant, ambush-protected vehicle, or MRAP, that was leading a patrol in Afghanistan's Tangi Valley in 2009 was upended by a 500-pound homemade explosive. Minutes later, a rocket-propelled grenade hit the cliff wall above, initiating a firefight that pinned down Kit Parker and the rest of the platoon. "We had an IED blow up a [mine-resistant, ambush-protected] vehicle," Parker says. "Four dudes inside. Four brain injuries. Some of these guys had already been blown up a dozen times." The 500-pound bomb that caused those injuries was just the beginning of an ambush that pinned Parker and the rest of the platoon against the cliff. Most of them didn't get out until the next day. Parker's second tour made him realize how bad things had become. In 2005, the year Moroski got hurt, the Department of Defense reported 15,530 TBIs among service members. By 2011, that number had increased to 32,907. By the time the wars in Iraq and Afghanistan were winding down, about 1 in 6 combat troops and a total of more than 300,000 service members had sustained some sort of concussion or traumatic brain injury, often from a blast wave. When U.S. troops began using heavier armor on their vehicles, the insurgents simply made bigger bombs. "They have a great weapon because it hits us at our scientific weak point," Parker says. "And that's the brain." The military medical system still didn't see it that way, though. It had been working under the assumption that most concussions weren't causing physical damage to the brain. As a result, troops who'd been near a blast but had no obvious injury were routinely returning to combat, where many got blown up again. Parker wanted to change that by providing evidence that the military couldn't ignore. 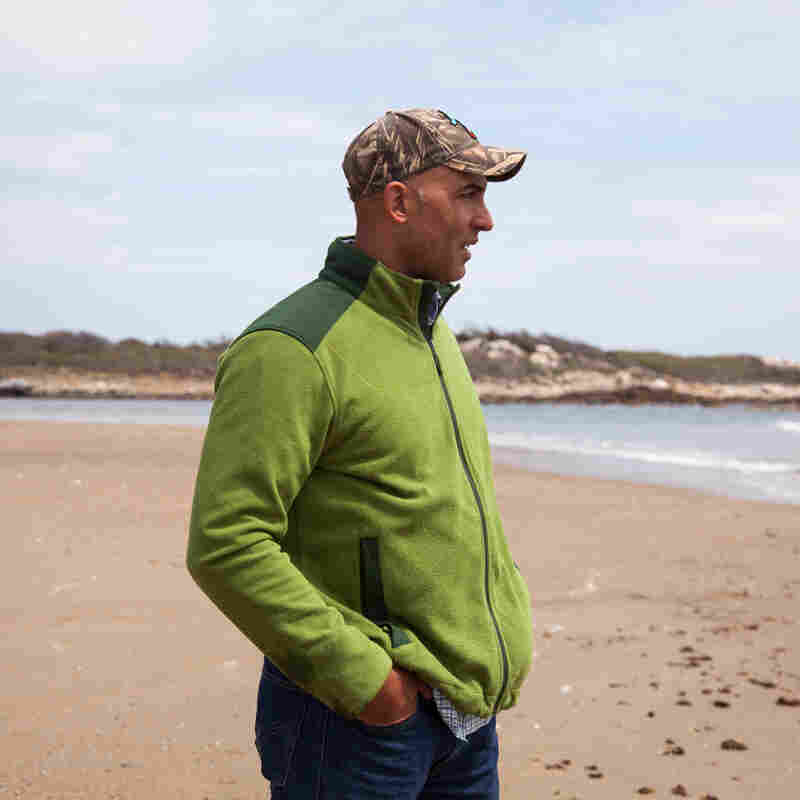 When Parker returned from Afghanistan, nearly five years after Chris Moroski had called him asking for help, the integrin experiments were nearly done. Finally, the team had results. "And we were right," Parker says. "We nailed it." In 2011, Parker's lab published a paper that showed how a blast wave could cause integrins to send signals that would disrupt the connections among brain cells. "When that happens, it affects the networks that allow you to recognize your grandmother's face or count your change at the fast-food restaurant," Parker says. "It was a fundamental insight," says Dr. Geoffrey Ling, who was considered the Army's leading expert on traumatic brain injury before he retired in 2012. Parker's research had shown how a blast wave could produce an injury that might be invisible but was indisputably real. And, at about the same time, another team of researchers found a way to finally reveal some of these hidden injuries. That team, led by David Brody of Washington University in St. Louis, studied the brains of 63 military personnel with blast-related TBIs. In about a quarter of them, a special type of MRI scan showed "definitive evidence of injury," Brody says. The images showed damage to the connections in the brain, which was precisely what Parker's work on integrins had predicted. 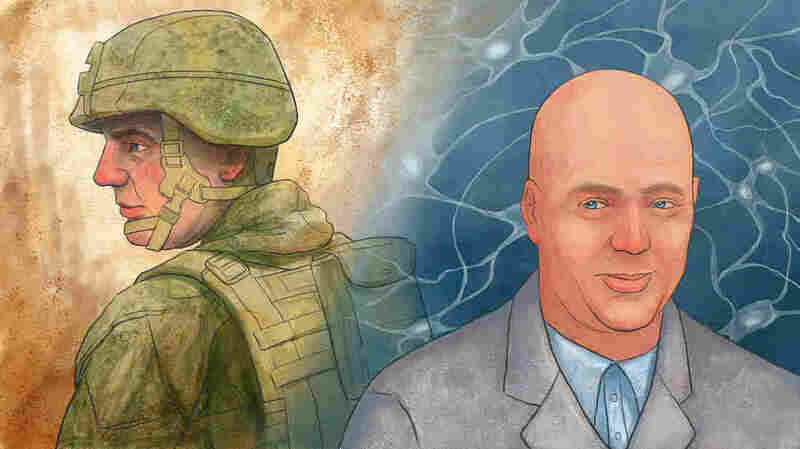 The next time Parker returned to Afghanistan, he was a member of the Gray Team, an elite group of doctors and scientists working to change the military's entire approach to battlefield TBIs. In 2011, they spent time in hospitals and clinics making sure a new protocol for detecting and treating concussions was being used and was actually helping soldiers recover. The Gray Teams (there would be four in all) had been created by Adm. Mike Mullen, the chairman of the Joint Chiefs of Staff. "We would tolerate multiple blasts, deployment after deployment," Mullen says. "I was determined to see if I could do something about this." To run the Gray Team, Mullen selected Christian Macedonia, a military doctor who had seen the concussion problem up close while serving in Iraq. 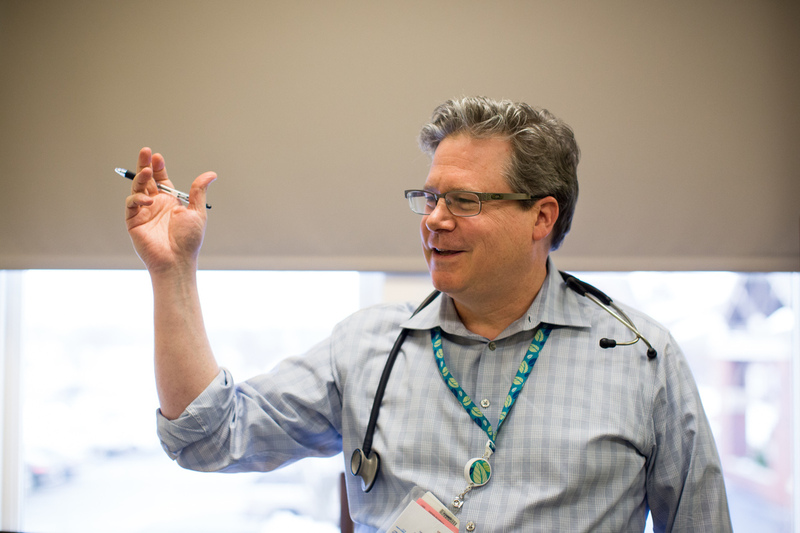 Macedonia then picked a handful of doctors and scientists he called his "Super Friends." "Quite simply, the Gray Team was there to establish ground truth with respect to traumatic brain injury," Macedonia says. Dr. Christian Macedonia led the military's Gray Team of doctors and scientists charged with finding the "ground truth" about traumatic brain injuries. Now, he's a maternal and fetal health specialist at Lancaster General Health's Women and Babies Hospital in Lancaster, Pa.
That meant challenging assumptions that went back to World War I, when shell shock was labeled a psychological or moral failing. And one finding of the first Gray Team was that in 2009, Macedonia says, military doctors were still following the dictum: "If you don't have blood coming out of your head, if you don't have a penetrating injury, you're fine, everything's OK, have a nice day." Macedonia's in-your-face style and relentless campaigning for change within the Pentagon infuriated many senior military medical officers. "He really stirred things up, and they came after him," Mullen says. Gray Team members say Macedonia never wavered. "Chris Macedonia doesn't give a f*** what people think about him if he thinks he's on the right course," Parker says. Ultimately, the military did an about-face on blast-induced TBIs. By the time Parker returned in 2011, it had adopted a protocol that required screening and a 24-hour rest period for any service member within 50 meters of a blast or with symptoms of a head injury. The protocol, put in place in 2010, also provided clinical algorithms for treatment of mild traumatic brain injuries, including multiple concussions. It had combat troops wear blast-wave sensors. And it began placing concussion clinics near the battle zone. Rest, time and sleep can make a big difference. After Parker intervened for his friend Chris Moroski, he improved. Today, Moroski still has memory problems, but has recovered enough to fly Black Hawk helicopters. Now nearly all troops with battlefield brain injuries get that chance to heal. "If I got a concussion in 2011," Parker says, "I'd rather have been treated in Afghanistan than the U.S."
Injured troops are less likely to be sent back into combat right away. But treatment options remain extremely limited. When the lab published its research on integrins, Parker thought drug companies would see the potential for new treatments. If faulty integrin signals were causing the problem, why not develop a drug that could block the signals or interrupt some other part of the cascade of events that damaged the brain? A treatment that works on blast-induced TBI would be likely to help people with brain injuries caused by a car wreck, or a fall, or a collision on a football field. And, if given soon enough after the injury, it would treat the problem in a way that no currently available drug can. But the pharmaceutical industry has lost billions of dollars trying to develop drugs for other brain diseases, especially Alzheimer's. And the companies evidently weren't ready to take on the costly search for a drug that might help people with traumatic brain injury. "I was surprised," Parker says. "No one wanted to get in the fight." His frustration peaked during a phone conversation with representatives of Johnson & Johnson. Parker was speaking from a forward operating base in Afghanistan at the time. 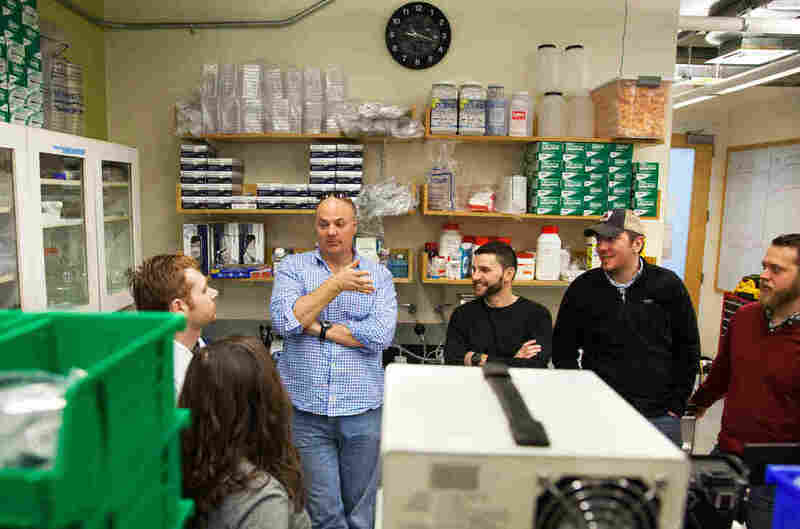 The purpose of the call was to discuss a discovery his lab had made involving heart cells. But Parker wanted to talk about the brain injury problem he was seeing all around him: "I was on the battlefield saying, 'Why don't you think about TBI?' " he says. "That seemed to have no impact." On a brisk January morning in Woods Hole, Mass., Parker, still an active reservist, is barking orders at several dozen scientists. They're shuffling around in identical gray hooded sweatshirts that say "Disease Biophysics." "Come on," he tells them. "Take bold steps. Only the bold win." The Disease Biophysics Group talks over progress in their research. John Doyle (from left), Stacey Fitzgibbons, Kit Parker, Ian Perkins, Jonathan Wood and John Ferrier are all veterans of the U.S. military. He's joking. Parker is just trying to get the scientists from his lab to line up for a group photo as part of the lab's annual retreat. But it's a moment that reveals how completely Parker has integrated his soldiering and his science. At lunch, Parker points to some of his researchers who are also combat veterans. "Stacey got back about a year ago from Afghanistan," he says. "Angie Greer was in Iraq and got a Bronze star over there. John Ferrier was in the Air Force in Afghanistan." Parker says he feels a special bond with the veterans in his lab. "It's pretty strong. I don't know really how to describe it," he says. "You love them." And Parker is counting on them to help turn a scientific discovery into something that will actually make a difference to people with brain injuries, including civilians. "Success is that a quarterback doesn't suffer from dementia after being sacked," he says. "Success is that brain injury is no longer the leading cause of death of children. Success is a war fighter gets blown up in some Third World rathole somewhere and he can still count his change at Burger King afterwards." So Parker's TBI team is sifting through thousands of proteins in the brain, trying to identify an easy target for drugmakers. It's painstaking work, and the lab no longer has much grant money to support it. But Parker says there's no chance they'll give up. "It's a very personal issue for us," he says. "This is not an occupation. This is an obsession."